I have a bit of a weird request: I'm looking for the original printed map from the first edition, not the mounted map. 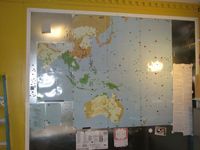 The reason is, we play EOTS a lot and I thought it would be fun to try a wall-mounted setup with magnets like some guys did for World in Flames or War in the Pacific. I only got the 2nd Edition with the mounted map, which is too thick to work with magnets properly. So before I go and buy another copy of the game(which would be less painful than it sounds) I thought I'd asked here, if someone who upgraded to the (updated) mounted map would be willing to part with the old printed map for a fair price. Please let me know if you're willing to sell or know a source where I could get a copy. If you grab a pdf or one of the large image files floating around the net of the map and take it into your local 'office works'(or whatever your local printing and office supply place is called) they can print you out a 'rolled'(no fold lines) copy of the map for a couple of bucks. You can request the map by itself. Thank you all for your kind advice! I'm sorry for my late answer, was a busy(i.e., travel heavy) Christmas, I hope you enjoyed yours and made fruitful additions to your collections.